Awesome and important article on street art and the idea of public and private property. People who see graffiti and street art as "vandalism" should not blame the people who make it. They should point the finger at an elite ruling class who do not allow access for poor people, particularly of color, to art and the venues set up to share and distribute art. As Ron English explains, one needs thousands of dollars and a legal and marketing team to have access to a billboard, just for a single month. How many people does that exclude from having access to such visible. Those who have that kind of resources usually have a singular perspective, one that is strictly commercial. If we did not create environments that oppress young people in their physical spaces, I guarantee there would be little to no "vandalism." What we need is free art programs for underprivileged youth and museums, galleries, and city facilities to offer space for them to have their work seen and their ideas shared. To paraphrase Henry David Thoreau, Most people hack at the branchs of a problem rather than strike at the root of it. To blame kids for trying to have a voice in the face of a system that forcefully works to keep them voiceless is simplistic and destructive. The billboards along I-10 and 35 are vandalism that is much more harmful to the spirit than a tag on a street car from a 15 year old kid. Let the insane replies begin (Along with the eloquent ones). .. very interesting .. wish to come one day in Your beautiful Country .. I wait u on my Blog..
Grisel, once again you really hit the nail. I often have enjoyed viewing this form of expression many times in various areas. Whether on the subways, riding on buses, automobiles, the sides of boxcars, or even on the side of a Rte. 22 North bridge wall( while waiting to pick up a load of asphalt from a a Newark plant @ seven in the morning; really super work who ever you are). I find the art form fascinating, and the artists are F'ing talented. I mean come on, have you ever screwed around with a can of spray paint. That is not an easy product to control! I seriously don't know how they do it. These beautiful murals and expressions are done by people who truly can and should be called artists. As far as space is concerned, I couldn't agree more. I believe that it is indeed unfair that the public spaces be owned, bought, sold, or rented to the only ones who can afford those spaces. And we all know who the hell they are. I have always given a lot of silent props to the artists who were able to beat the system and have the time to be able to even pull these wild, semi-stunt like, fast-served art pieces out of their souls. Some of these artists are rather quick in their ability, too. Logically, some pieces are risky to execute and have to be done quickly while others may take some serious time in planning. This brings me to thought. Look at those stamps again. What an awesome idea. I would totally love to make a stamp and have it spread around. I wouldn't even want any money for it, just the ability to share something with this crusty world. "Aaaaaaaarrrrrggggghhhh, it was ah nasty globe for sure." Those stamps are creative as all hell! I want to be able to buy those, you know? So yes, thought. You see spray painting involves not only off the cuff excitement, but it presents us with some rather well planned pieces of art. Some of these murals take hours and hours of time, and that is just one way of showing an artist's true love. There's a mural done on a wall a few blocks east of Ferris High School in Jersey City, NJ. I tell you that every time I pass that spot or have to wait for the light(one of the few times I don't mind), it brings such delight to me to sit and stare and appreciate what someone took the time to share with the world. That's pretty powerful stuff, at least to this soul. One of the main reasons it is looked down upon because sometimes the artists and the punks get mixed up. Let's face it a lot of us have messed with someone's property that we really shouldn't have tagged up. People naturally get upset when their home, fence, car, garage, or what have you gets destroyed. This is the big difference between disrespect and true art. This is what breaks it for a large percentage. They see all of it as disrespect and not art; thus sending out a lot of bad vibes. Hey Drew and any other potential artists out there, if you want to create your own stamps - legally, that is - you now have that option. My really awesome sister-in-law, Susan/Susie, made me aware that the U.S. Postal Service has provided that option. I still think TEWZ's sneaky stamps are something special; doing it through the proper channels takes something out of the message for me. However, if I want to create some stamps with Julia de Burgos, for example, I can do that - maybe USPS has something there. I don't have to buy the Reagan nonsense or none of that stuff, if I don't want to. Okay, I have to say this. Drew has some of the best replies to blogs, the guy should have blog of his own, , I swear. It is quite amazing what those artist do. I show graffiti to my students, and then I tell 'em, "Okay how many of you can paint that? Okay, how many of you can paint that with a few spray cans? How many can paint it with only a few spray cans while hanging between two train cars and looking out for cops and in under 20 minuntes?" It's quite amazing if you think about it. For Drew or anyone else who is interested in knowing more about graffiti and graffiti culture, check out an unbelievable documentary done back in the 70's called "Style Wars." It really captures the heart of the art form. And what is incredible is that alot of the artists they caught on camera, while some of them wound up in jail or in a coffin, many of them are now renowned artists being shown in galleries, touring the world, or at least making a living teaching and pimping peoples rides and stuff. Also google Marc Lawrence, a cat I did a project with at Taft High School in the Bronx. We did a Poetry and Graffiti Project Together with the High Schoolers. He actually did walls for 50 Cent, though I hate the guy, he paid Marc something nice to do his house, and it has given Marc Lawrence the rep to own his own shop, where he brings in kids and gives them jobs as apprentices. It's that community service factor about Graffiti people that is little known and understood. Thanx for your comments left at my Black Educator blog. The group I belong to- Black New Yorkers for Educational Excellence (BNYEE) would like to share your comments on our listserv. We have had many many Black & Latino educators tell us variations of this horror story. A few of them are active with us in BNYEE. The Bloomberg-Klein cabal is institutionalizing what Giuliani, Albert Shanker and Koch could only dream of: the double whammy of "whitening and privatizing" the NYC public education system from the TOP down. Well, we're working on reversing this trend with a multitifaceted form of the fight to achieve true community/neighborhood control over the K-12 public school system. Stay tuned for the first salvo of information, analysis and proposals for complete redesign/system-change! 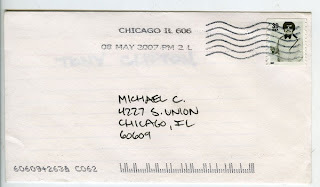 Now for the obvious question: did dude actually attempt to use those stamps, and was the mail delivered? Yes, Onome. 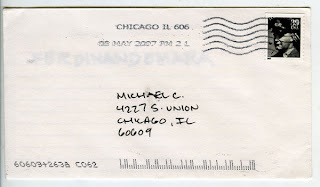 The stamps worked (note the postmark on the envelopes). There are several others, too. Only daredevils should try this at home. Just like the origins of spraycan art, it is risky. Speaking of illegal art.... Ironically, Angelina Jolie and Brad Pitt have become major patrons of Banksy artwork (he is an amazing English stencil artist that has strong political subject matter). I'm not exactly sure how I feel about the faces of U.S.B.S. purchasing art that is supposedly against everything they are about. impatient to see additional of your content articles, cheers!